The most complete tour of Ecuador of all includes Historic Quito, the oldest Indigenous Market in Otavalo, the adventure packed Baños, a train ride around Devil's Nose, the Ingapirca Ruins, colonial Cuenca, Vilcabamba, and Ecuador's port city of Guayaquil. Reception and transfers to Hotel in Quito. Delve into the heart of colonial Quito and experience the charm of Independence Square with its awe inspiring Cathedral, Presidential Palace and Archbishop's Palace. 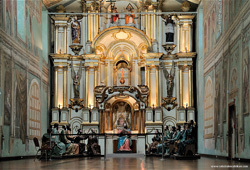 Admire the church of La Compañia (1605); considered to be the finest example of baroque architecture in America. Not forgetting the church and monastery of San Francisco (1535). 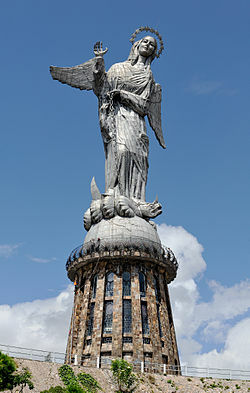 Our tour then takes you to Panecillo Hill an ideal location for a panoramic view of this historic capital. Our country, needless to say, owes its name to the Equatorial Line which crosses it 15 minutes to the north of Quito. There you find a monument marking the latitude 0º 00’ 00” this is a very fun and unique place where you can literally jump from the northern to southern hemisphere of the planet. 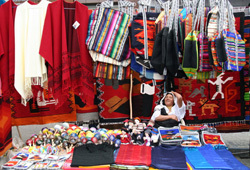 This tour includes a visit to the Ethnographic Museum on site. Certificates are awarded to visitors who take part in this adventure. Accommodation in Quito. 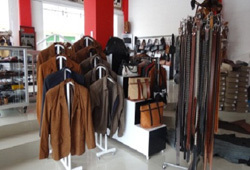 On the second day we visit Cuicocha and the interesting town of Cotacachi, an entire town dedicated to selling fine leather products and handicrafts. Later we return to Quito, where we will spend the night. We embark on our journey south on the Panamericana highway in the early hours of the morning following collection from your hotel. 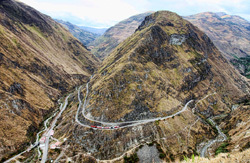 This route is the connection between “Andes” and “Costa”, passing several small towns regarded as having had a great influence on Quito. This is followed by a beautiful area known as “Volcano Avenue” here volcanoes such as; Corazon, Rumiñahui, Iliniza Norte, Iliniza Sur and Cotopaxi one of highest snow-capped in the world might be seen. We enjoy a typical lunch in one of the nearby haciendas with accommodation at La Cienega. This active volcano is home to an unmissable, magnificent lagoon of turquoise water. A perfect spot have lunch and continue to the southern part of the highlands, crossing rich valleys and cities such as Latacunga and Salcedo. Upon arrival to Baños, a city known as the "Door to the Amazon Basin", we visit an area with beautiful waterfalls, tomato trees and a wide variety of orchids, if the weather permits. Accommodation at La Floresta or similar. 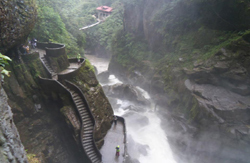 We start the day by visiting several waterfalls, the most spectacular of which is "El Pailon del Diablo" (the Devil's Cauldron), others include "Manto de la Novia" and "Agoyan". Accommodation at La FLoresta or similar. We advance along Panamericana highway until we get to the city of Riobamba, located at the foot of the snow-capped Chimborazo (6310m). 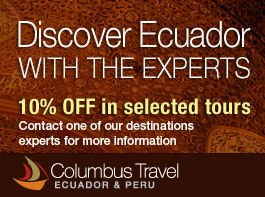 This historical city represents a great deal of importance as the first Ecuadorian Constitution was established here. Places to visit include the Cathedral and the museum of Las Conceptas, there are also a number of other places worth visiting. Overnight at Riobamba in Hosteria Abraspungo or Andaluza. 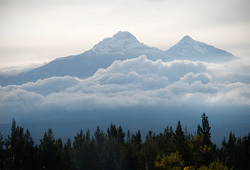 The day commences with a trip through the highlands offering spectacular views of Chimborazo. Arrive to Alausi to begin a breathtaking descent down the Nariz del Diablo, a 45-degree gradient mountain. Once back in Alausí we drive south towards the fortress of Ingapirca, a major pre-colonial Inca site which dates back to the 15th century. This is the most important religious and political monument left by the Incas and the many pre-Columbian cultures that once dwelled in this area. 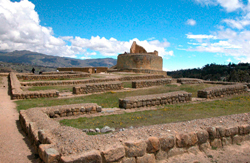 It is a direct testimony of their mechanisms of defense and how the Incas really lived. Before returning to Cuenca in the late afternoon to enjoy a well deserved rest at the hotel. *Important: Due to operational reasons and rail maintenance the train portion of the trip is subject to cancellation without previous notice. The train operates everyday except on Monday and early wake up is required to complete this trip. At a leisurely pace guests enjoy a full day of discovering the beauty and charm for which Cuenca and its surroundings have been internationally recognized for. This World Cultural Heritage Site surrounded by red tiled roofs, cobblestone streets, florid squares and museums make it very a very special place . Hotel accommodation and evening meals at hotel Carvallo or Crespo. As we depart from Cuenca and enjoy the Andean scenery we pass through the town of Saraguro, famed for its weaving and distinctive indigenous population. Later we descend into the unique warm valley of Vilcabamba. This beautiful and tranquil place provides an ideal opportunity to relax in an agreeable climate. The evening meals and accommodation are at Madre Tierra or similar. Early in the morning we head to Zaruma, a beautifully conserved colonial city perched on a hilltop with steep, twisting streets and painted wooden buildings. Its magnificent architecture and culture give this pre-Hispanic gold mining city a beautiful and unique appearance. The evening meals and accommodation are at Hotel Roland or similar. 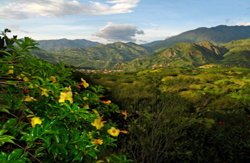 As we depart Zaruma to make our way to Guayaquil we pass Portovelo, an outstanding location with mountains, valleys, volcanoes, rivers and lakes with a marvelous mixture of colours and vegetation, offering the most beautiful landscapes in Ecuador. We continue our journey to Machala, known as the “World Capital of the Banana". 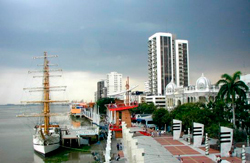 Here we enjoy the climate change from the cool highlands to the warmth of the coast and finish the trip in Guayaquil. Accommodation and evening meals are at Guayaquil.